Editor's note: The following story is a feature written by Hannah Preston, who, with climbing partner Michelle Kadatz, was awarded the ACC's 2017 Jen Higgins Grant for Young Women that helped them pursue climbing goals in Patagonia in 2018. She describes the trip and reveals some of the personal challenges she faced in while in the mountains of Patagonia. 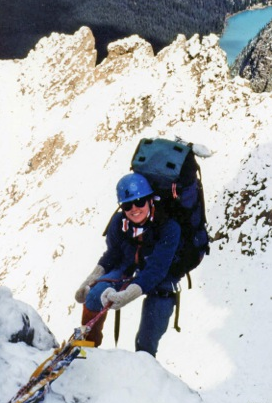 Hannah has been climbing since she was a kid with her teddy bear clipped to her harness, and since then she has dedicated years to travelling, rock climbing, mountaineering, and improving her technical skills. She has climbed El Capitan in Yosemite Valley four times, sent 5.12 in five different countries, and loves combining the techniques she's gained from climbing on rock types around the world. Hannah is an ACMG Rock Guide who started guiding driven by her passion for teaching people the technical side of climbing as well as the emotional achievements that come with challenging herself and connecting with nature. She is also an Industrial Rope Access Technician and enjoys geeking out on the physics of rope systems. Fitz Roy from Standhart Col. Photo by Hannah Preston. So much of being in the mountains is about tapping into our deepest strengths and finding our confidence. I often find my greatest strength comes when I take the time to consciously honour my weaknesses, in an effort to improve and grow. Some of these weaknesses are things like reading home insurance policies, managing my fear of sharks while surfing, and needles (I'm a fainter), but the most daunting one has to be saying goodbye. This trip to Patagonia represented an opportunity for me to practice. Carlyle Norman was an amazing woman I'd had the honour of becoming close with in Yosemite in 2011. We climbed and laughed together and I was inspired by the bright light that she was. Only a few months later she passed away while climbing St. Exupery. So, in addition to being a climbing trip of a lifetime, going to Patagonia was lining up to be a trip about learning how to say goodbye and facing the mountain of fear I'd built up for the mountain range where Carlyle was lost. My climbing partner Michelle Kadatz and I arrived in El Chalten on Jan 18th, 2018 to a promising weather window approaching. We decided to focus on the Torre valley to start because it offered some climbs which would be good for familiarizing ourselves with the range. Also, Claro de Luna on St. Exupery, which holds some importance to me, is there. I would like to get to the summit of the mountain where Carlyle passed away. Our initial hike in with our gear wasn't without incident. Unfortunately, on one of the roughest sections of the 18km hike to base camp at Niponino, the wind picked up with gusts strong enough to force us to sit down. One of these gusts hit Michelle at a bad moment and she lost her footing, causing her to tumble down the steep scree slope below her. Michelle taking a moment to assess the damage after triple tomahawking down the steep scree slope. Photo by Hannah Preston. I watched in horror thinking she had certainly broken an arm or a leg but was relieved to find that she was only bleeding from a deep gash on her forehead and had a mild concussion; thankfully nothing was broken and she could walk. She would, however, need stitches. It meant stashing our gear where the fall took place and returning to town for a visit to the doctor. We hiked back the next day, even with Michelle's puffy racoon’s eyes, and finished stashing our gear. Michelle following pitch 4 of Rubio y Azule. Photo by Hannah Preston. At the earliest opportunity of good weather we got back to the Torre valley. We were able to climb two "warm up" routes. With only two days of good weather, we climbed Voie Des Benitiers on El Mucho and Rubio y Azule on Media Luna, back to back. Both have relatively short approaches and straight-forward rappels but are still graded 5.12 and 5.11+ respectively. 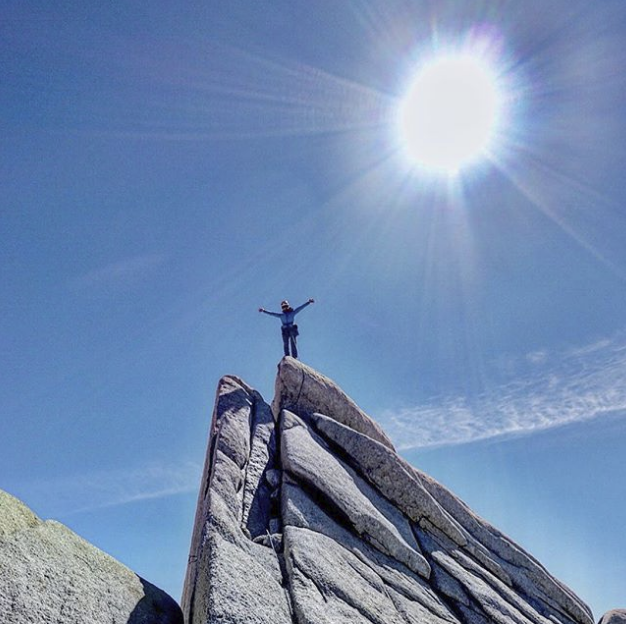 We were ecstatic to climb on the beautiful granite we'd been dreaming of. But with bad weather approaching, we headed back to town. The poor weather in the mountains continued for the next ten days. This is not the kind of expedition where you'd choose to spend a week getting hammered by the weather in your tent. Luckily, the weather in town is often OK even if the mountains are getting slammed. Life in town became an interesting and surprisingly fun mix of eating, sport climbing, sleeping, bouldering, happy hour, Asados, running, ice cream, social coffee, and practising my Spanish. Because everyone is stuck in town it can be extremely social if you want it to be. It's almost overwhelming the connections we made to new friends in the short month we were there. Hannah running outside of town. We planned to go up and over the Standhart Col to the base of the Ragni Route, so we started back in Niponino to pick up our gear that we had stashed. Our gear stash happened to be adjacent to the camp of some friends from New Zealand which led to some much appreciated social time in the mountains; an even more welcomed opportunity because of the remoteness and the improbability of it all. Base camp fun. Photo by Hannah Preston. We hiked in light and did a big gear sort to properly pack for the climb, all under the stare of Cerro Torre. Moving on from Niponino we slept at the Nunatuk bivi spot, which would put us in a better position to start on the Standhart Col early the following morning. At 5 am the next morning we woke up to heavy snow with very limited visibility. We decided to wait an hour to give it a chance to clear before heading up. Traveling up the col was quick at first, although visibility was challenging. The snow squalls would clear just long enough to navigate. After only an hour of walking we started to hit waist height snow drifts and gaping crevasses. Some of these we were able to walk around, while others necessitated full belays to protect the ice climbing boulder problems blocking their passage. Through the snow flurries we could eventually make out an orange tent up the col ahead of us. It was our only landmark as we snow slogged up the slopes and ice climbed through the more technical crevasses. At times I couldn't see anything and then it would clear just enough to catch a glimpse of orange fabric. Eventually, as I post-holed my way to the tent, I could hear Eddie Vedder's song “Society” playing. My chest clenched and I looked across the valley at St. Exupery, surprisingly visible as the flurries broke to beams of sunshine. I flashed backwards six years to the side of an interstate highway in Tennessee when I had pulled my car over, unable to see through my tears, and cried with the song on repeat for a friend, Carlyle, who I was struggling to say goodbye to. I don't hear this tune without thinking of her and she is everywhere in that valley. I snapped out of the memory as happy faces appeared behind the door of the tent and I was glad my momentary time-travel managed to go unnoticed. We were worried about avalanches and slope stability due to the amount of snow that had just fallen. The group agreed, and said it was the reason they had decided to bivi midway up the col the night before. One of the climbers named Dan casually mentioned they had heard something big come down in the night. Keen to get a better look of the terrain ahead, we went up to see above the ridge feature that the tent was tucked underneath. We popped our heads over the ridge just as the morning sun was coming out, and knew it would effectively bake the entire slope in question, as well as the loaded slabs overhead as it gained strength through the day. About 30 feet to the side of our friends' tent, we could now see that the debris from a size 2-3 avalanche had spilled over the ridge. That must have been what they'd heard in the night. We decided not to continue until the evening when the sun was gone and the slope had had a chance to settle, when conditions would be more stable. We waited in the sunshine with the power of the Torres swirling around us. Thankfully, we had new friends to share jokes and food with in the warmth from the sun. I could feel my hunger subsiding and laughter filling my lungs; a relieving contrast to our stressful morning. We continued up the col once it had gone into the shade. It was waist-deep slogging for most of it and I still felt on edge with the amount of snow and spindrift around. We pitched out several steep ice sections in the final 300m of the gully, reaching the rappels at the top just as it was getting dark. Fitz Roy glowed pink in the final moments of daylight across the valley. We slept that night at the base of the rappels. It seemed like the best option given that it was the middle of the night and we were unsure of which direction to descend the glacier. We awoke to the most beautiful cirque I've ever seen. The rime was pasted to the upper walls of the peaks making the tops of each intimidating tower glisten and sparkle. Descending to the base of the Ragni Route on Cerro Torre took longer than I would have liked; we arrived at the base at 11 am, again in the baking sun. We decided to rest through the heat of the day and climb later in the evening and into the night for better temperatures. I lay down to rest, soaking up the sun, intermittently staring up at the Torre and napping. I felt warm, which was peaceful, after struggling in the evening cold while climbing the col the night before. It's these moments that matter most to me in the mountains. Every quiet moment I get, I'm taken back to being on the summits of Vancouver Island mountains as a young teenager with my father. We would stare up at the clouds together and I would wonder what my life would look like. We started up the snow slope at the base of Cerro Torre around 5 pm. Though it hadn't cooled down too much, we were hopeful by the time we reached the mixed pitches that it would be cold. That ended up to be wishful thinking. When we got to the base of the climbing at 7 pm it was obvious they needed to freeze overnight along with the snow gully above them. There wasn't much to do besides sleep and try early the next morning. "The moment we realized we were 12 hours too late getting to the base of Cerro Torre after two days of beast mode." Photo by Michelle Kadatz. We had brought light sleeping gear up the route but had hoped to be using it higher than we were. “Shiver bivis” are a part of moving through the mountains in lightweight alpine style; no one really wants to have to spoon with their climbing partner, but sometimes you just get cold enough that you have to. I started calling these shiver bivis "cucharita de los montanas". Turns out I'm big spoon. We woke up at 3:30 am to an updated weather report on our satellite phone that did not look good. As it got lighter in the morning we could see the storm building across the ice cap, confirming that we had no choice but to give up on our objective. We knew that was it. The long-term forecast wasn't good enough to be worth waiting for better weather. It was an anticlimactic and disappointing realization but it was time to turn around. We hiked out via Marconi Pass over the next two days. It's an absolutely stunning walk behind and around the Torres and Fitz Roy and is therefore very, very long. It's about the length of a marathon, travelling along the ice cap, over the receding glacier in Marconi Pass, down rock slabs, and then out along the valley of Laguna Electrico and Rio Electrico. Seeing all of the spires from different angles and gaining a deeper understanding for the mountain range distracted me from the pain in my feet, the pack rubbing on my low back, and the palpable frustration we both felt at being turned around so low on the route. I held onto the peaceful moments we'd had. Back in town we rested and looked at the long-term forecast to try and assimilate a bit of a plan for the remaining week we had left in Patagonia. Our gear was a bit of a mess. We'd brought only what we needed for our Torre attempt from Niponino and then returned to town via a different route, leaving our approach shoes and much of our climbing gear still in the Torre Valley. Looking ahead at a one day weather window, we decided we would very much like to climb Guillaumet. It's an achievable goal for one day of good weather and the rock is amazing. In order for this to happen we had to retrieve our remaining gear from Niponino, which we did in a 40-kilometre, 9-hour, double-blister day. A day later we were able to go for our final mountain mission to Guillamet to climb the Comesaña-Fonrouge. We shared a cab from the hostel with two friends, Kiff and Sam, at 3:30 am and were dropped off 20 kilometres down the road at the Rio Electrico bridge. It rained so much the previous week we had to make multiple, shoes off, creek crossings which induced fits of giggles under the stars. The mood walking in was lighthearted; we were going to go climb a beautiful rock ridge! Michelle rappelling on Fonrouge. Photo by Hannah Preston. We got to Piedra Negra bivi at 7 am and while it was clear and sunny, it was very windy. We knew it was forecast to improve in the afternoon so we took a small break there before continuing to the ridge. The climb proved to be as amazing as I'd heard it to be. Easy scrambling turned into exposed 5.7 which led up to a headwall with a splitter corner; all on golden granite. We simul-climbed the easier terrain and then pitched out through a couple of 5.10 sections. The summit ridge was spectacular, easy scrambling and walking with a V0 boulder problem mantle to get onto the true summit. Hannah on the summit of Guillamet. Photo by Michelle Kadatz. From my perch on the summit boulder I admired the 360-degree view I had of the surrounding mountains. Cerro Torre was behind us, along with neighbouring spires, and Fitz Roy was beside us with Mermoz in between. The Pillar Goretta on Fitz faced us and absolutely took my breath away. I could see that it is the same golden granite we'd just been climbing and it loomed large above us. I've had reoccurring dreams about being on Fitz Roy; some good ones and some nightmares. Staring up at the pillar I knew they weren't going to go away any time soon. Between Cerro Torre and us was the needle spire Pallone that Kiff and Sam had set out to climb. I looked over and wondered where they were. I knew our Kiwi friends had planned to climb Mermoz beside us, and looking closely I noticed I could actually see them. I gave the best and loudest monkey call I could muster and was rewarded with one in return. What a playground. We descended via The Amy, a popular ice couloir with clean rappels. Sunset glowed behind the ridges of granite as the warmth of the day quickly evaporated. The hike back down to the valley hammered on our knees and feet and I was grateful for all the hiking we'd been doing the past month because my legs felt strong, even when tired. I passed the time walking the flat section out to the road like I was in a trance; the ability to walk with brain and body disconnected seems like a lost art in our modern lives. We arrived back at the road at 10:30 pm to a quiet, dark silence. Yup, good luck hitchhiking back to town. I knew there was a campground about six kilometres back so we continued our march towards town, hopeful the campground would have a phone we could use to call a ride. They did, and better yet, they also sold beer. We arrived back at the hostel at midnight and gratefully climbed into bed. We spent our final days in El Chalten bouldering and running, daydreaming about the range. We had barely scratched the surface. Topped out some easy climbing in town with monkeys. Photo by Hannah Preston. I contemplated the tragedy of Carlyle's death as I stared at St. Exupery from town: had I really come to peace with saying goodbye to her? Even without climbing St. Exupery, every time I looked at it I thought of her. Over the five weeks I spent in El Chalten I went through a full range of emotions from sadness and grief, to a deep rage, to an acceptance that these amazing granite spires give and take; we can only move forward. In remembering our loved ones who've passed, we feel their story and their energy. I'd come to Patagonia to try and overcome fear and say goodbye. What I found was a deep love for a mountain range that holds the energy of an amazing woman. Spending time with her memory while I am in those mountains, if feels like she is still here. Returning home from a climb, my hands, feet, and muscles hurt but it's a good hurt because of the amazing day climbing. My heart breaks to say goodbye to everything this place holds. But it's a good hurt. I'm so much more full of love for these stunning mountains and the people in them; past, present, future, here and gone. Until next time, Chalten.